Since my notes from January have been a fun thing to do and you seem to have liked the idea, it's time for another round! 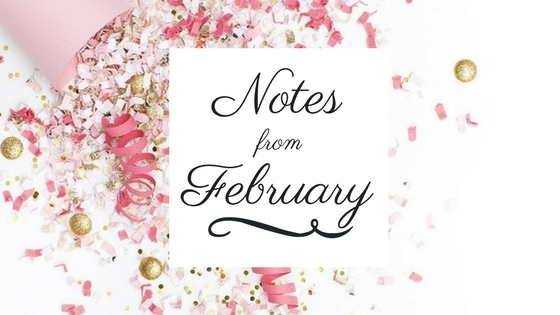 Notes from February are here! We have been internet-less at home for what it felt like an eternity! Living offline is a struggle when everything runs on data and magic. Even The Sims! I have always claimed my inability to read more than one book at a time, and look at me now: listening to an audio-book in the morning (The host, by Stephenie Meyer), reading the paperback version of Barefoot investor (by Scott Pape) on the bus, and the e-book version of The invasion of the Tearling (by Erika Johansen) at home. RUPAUL'S DRAG RACE. I know I am super late on the drag wagon, but better late than never! Those people are so talented, watching their runways is highly inspiring. They have wit and looks, and they serve conceptual art on high heels. What's not to like? SUNTAN. Don't get me wrong, I will always be on Team Pale, but, I have to admit, it's pretty useful having a slight tan to match the poorly judged foundations/concealers bought throughout the year! Store lighting can be deceiving and 'fair' is not always fair enough, and we punctually end up hoarding make-up that doesn't match our skin tone. First world problems. IMPROV THEATRE. I finally did it! After that first class I attended when I was studying in England, I decided it's time to try improvisation theatre again. I went to a couple of shows here in Melbourne and I am seriously considering going in for a proper course this year! WEATHER. I don't know if you heard this, but for a couple of days almost all Australia was above 40 degrees, Celsius, that is. I said almost because the hot weather carefully avoided Melbourne, resulting in a sudden season change and in a choir of coughing and sniffing on any public transport. Goodbye summer. Welcome flu. TRUMP AND THE MEDIA. At this point I have serious trouble figuring out if news articles on him feature his actual words or satire. And it's something people shouldn't have to wonder, especially when it comes to the president of the United States. BEING DISCONNECTED. What more can I say? Could Diagon Alley be the most magical place on Earth? This is the reason why I love leather jackets. What it feels like being a young woman in today's society. You got your first apartment, now what? About the wonders of bullet journals, and where to start. Dealing with Seasonal Affected Disorder. Living abroad will ultimately improve your life. Things you learn when you become an adult. The philosophy of rainbow hair. Techniques that will help you not take things too personally.